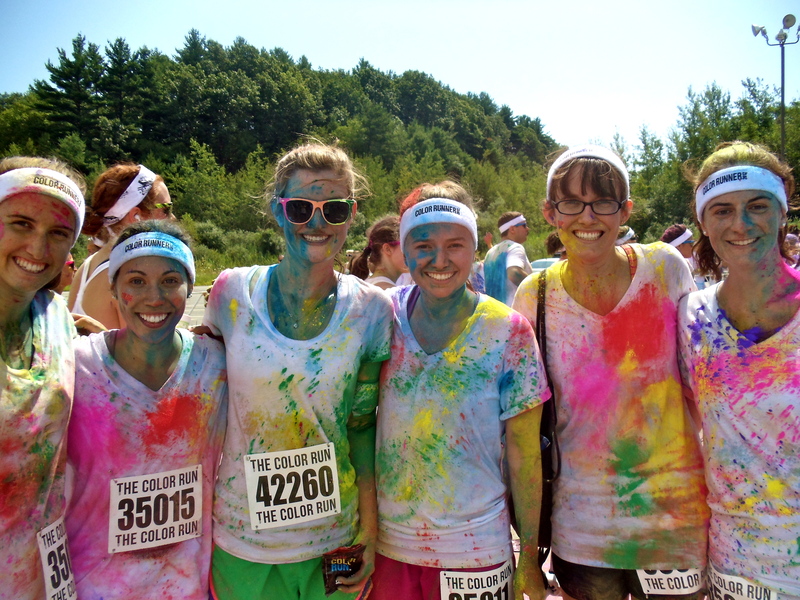 Race Recap: The Color Run New England | Fit Girl. Happy Girl. ← Compression sleeves, what’s the deal? 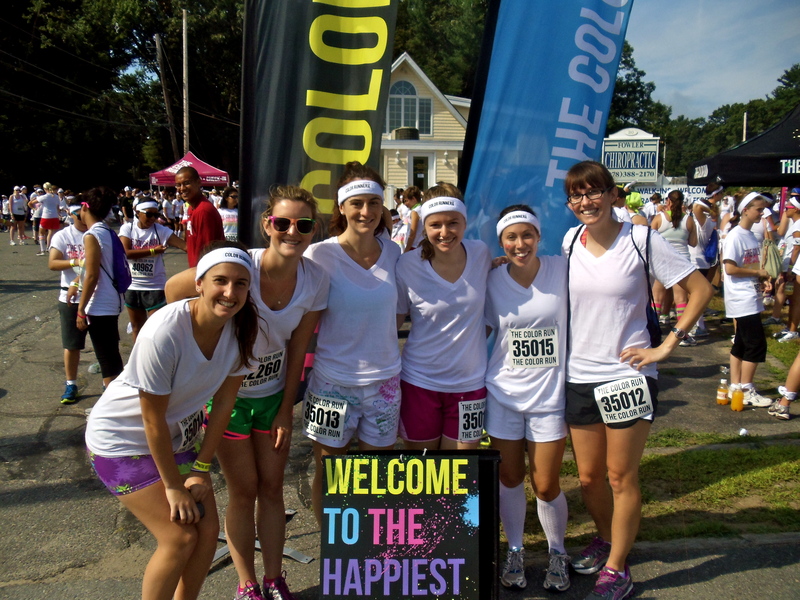 Last Saturday I ran the famed Color Run with my college roommate and a group of new friends! 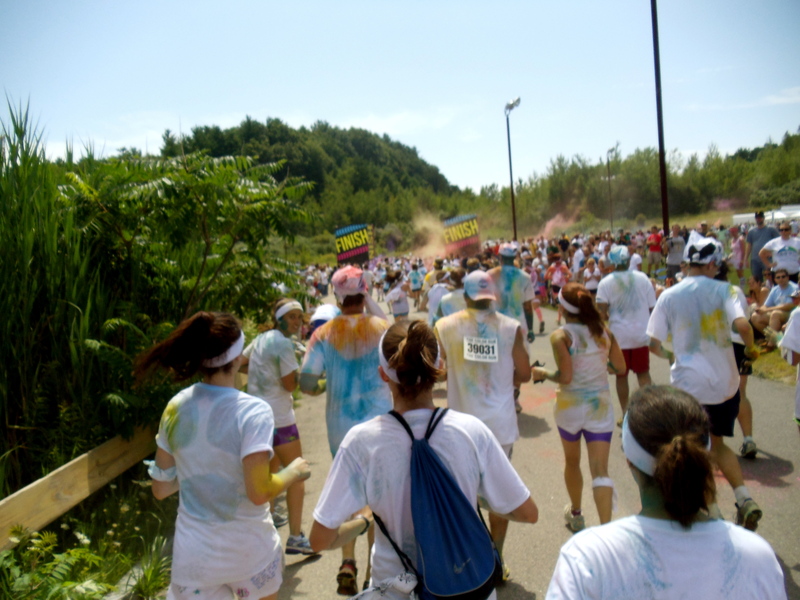 The Color Run claims to be “the happiest 5k on the planet” and I have to conquer. However, there were some minor setbacks that really could have ruined the race if it wasn’t so much fun to begin with but looking at it as a whole, I thought it was a blast! The race was located in Amesbury, Mass. and finished at the Amesbury Sports Park. The day I ran the race, the announcer at the starting line said there was nearly 11,000 people running- that’s a lot of color runners! Needless to say, the race was absolutely packed. My friends and I all wore white in order to get the most out of the color along the way. If you’re not familiar with the Color Run, it is a 5k route and at each kilometer mark the wonderful people from the Color Run throw colored corn starch at you and by the end of the race you are a fully-covered tie-dyed runner! It’s awesome. We arrived at the Color Run around 8:30 a.m. and took the shuttle to the starting line. We were shocked by how many people were actually participating in the race so we decided to get to the starting line as soon as possible. The staffers of the Color Run released the runners in waves, separated by five minutes as to not clog the course too much. While this was a valiant effort, I still felt the course was far too crowded and I’d say the majority of people ended up walking rather than running. This caused quite a problem for those of us who wanted to run because we had to dodged and weave in between the walkers. Also, in order to get a good amount of color at the color stops at each kilometer, we had to slow to a walk. This was fine but messed with the run a bit. Besides the crowds I thought the run itself was great! My only wish is that it was longer because it was over sooo fast! The end of the race was a big party. We were all given color packets that we were able to open at the end and throw up in the air, completely covering ourselves in color, in case we were covered enough to begin with! We were able to get samples of drinks and granola bars at the end which was good because the temperature skyrocketed during the race. At the finish line, post-color! One of the concerns I had for the race was the lack of water on the course. There was one water stop about halfway through the course but the water was warm and not very refreshing, especially after a ton of color got in my mouth. Another issue that was really beyond the race directors’ control was the shuttling back to the parking lots after the race. The place we had to park was about 15 minutes away because the Amesbury Sports Park couldn’t accommodate the amount of runners, which is totally understandable. When we got in line to go back to our cars we were informed there had been an accident on the highway so all shuttles had to be rerouted. We ended up standing in line for about an hour and a half, in the sun, with no water. After running a race this was a little frustrating because we were tired and thirsty. The Color Run sent out an e-mail on July 30 apologizing for any frustrations, which I think everyone appreciated. I have friends who ran the race on Sunday and said it was fantastic and there were no issues, so I’m glad everything worked out in the end. As you may have noticed in this post, I didn’t tell you my finish time. That’s because I didn’t have one. No one did. The Color Run is simply for fun! Plus no one would have gotten a good time anyways with the frequent stops and bobbing and weaving in between walkers. Another issue that came up during the race was some knee irritation. I think due to the bobby and weaving in between walkers I aggravated my runner’s knee. It’s still bothering me four days after the race so I’m trying to rest it and praying it will get better soon!! Overall it was a really fun event and I would love to do it again. I hope you consider running it in your area! 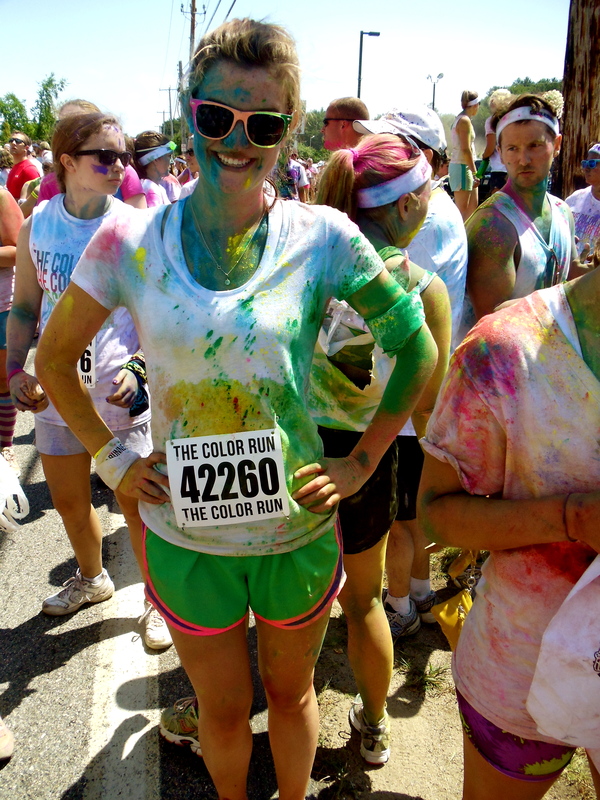 …and I’m a color runner!